How much do you care about YOUR mental health? “According to the 2019 State of Mental Health in America Report, over 44 million American adults struggle with a mental health condition, and the rate of youth similarly affected is on the rise. While this a staggering number, there is some positive news for those prone to depression and anxiety. Recent studies have discovered that spending time in nature can be a powerful tool for improving overall well-being and managing mental health. The great outdoors has plenty to offer in the form of fun and recreation, but its influence on your overall health and wellness is worth investing your free time and attention in. The returns come in the form of an overall healthier and happier life.” Find out 6 ways to improve your mental health by reading the story below. Ever Heard of OSU’s CoF Transfer Professional Program? The application for admission to the professional program in OSU’s Forestry, Forest Engineering, and Forest Engineering-Civil Engineering programs is now available! What is the Professional Program? You will complete all the required pre-professional courses in your major by September 10, 2019. You can consult our Transfer Guides to determine how your courses apply to the requirements. NOTE: students are welcome to transfer to OSU at any time. If you have not yet completed all the pre-professional courses for your major, you can still transfer to OSU as a Pre-Forestry or Pre-Forest Engineering major and complete them here. Then you can apply to the Pro-School in a future year. Apply for transfer admission to OSU’s Corvallis campus. Declare a major in Pre-Forestry, Pre-Forest Engineering, or Pre-Forest Engineering/Civil Engineering. If you aren’t admitted to OSU, you won’t be able to complete the application for the College of Forestry Pro-School. Transfer applications for fall 2019 are being accepted now. If you haven’t already applied, you should do so ASAP! Once you are admitted to OSU and have an OSU ID number, you need to complete the College of Forestry’s Pro-School application. The preferred deadline to apply for fall 2019 Pro-School admission is April 15, 2019 (11:59 pm Pacific). What are the required pre-professional courses for my major? Consult the Advising Guide for your major to find the required pre-professional courses. You may find our Transfer Guides useful as well. What if I won’t have all the required pre-professional courses complete by September 10, 2019? Students are only admitted to Pro-School if they have completed ALL the required pre-professional courses satisfactorily. If you are missing courses, you may need to apply to Pro-School for a future year. We encourage students to work with their academic advisor (and to contact us at forestry.proschool@oregonstate.edu ) to determine the best timeline for Pro-School application. Can I apply to the professional program for a later term (e.g. winter, spring, summer)? Students can only enter Pro-School in the fall term. We do not admit students to Pro-School for winter/spring/summer terms. This is due to the sequential nature of the Pro-School coursework and the need to begin those sequences in the fall. Entry to the Pre-Forestry and Pre-Engineering majors is unrestricted, and students can begin the pre-professional courses in any term. When will I know if I’ve been admitted to Pro-School? Admission decisions will be communicated via email (to the email address you list on your application) by May 1, 2019. When does Field School start? Field School will be Wednesday, September 11th – Tuesday, September 24th. As we all have heard by now, the government did it’s (almost yearly thing…) shutdown. Thankfully at this time a temporary conclusion was met between officials and it is up and running again, but for how long? 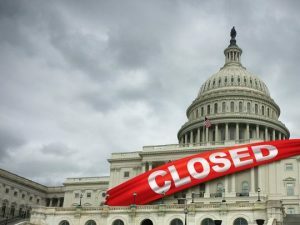 It was the country’s longest shutdown and thousands of federal workers were effected. After seeing so many headlines in regards to vandalism, unemployment, debt; I came across a new perspective. Did you know…? Wes Siler from Outside Magazine has some information in regards to it that maybe you haven’t heard about just yet. Winter Term Has Arrived, But What About Winter? As I sit warmly with the sun basking through the window, I am grateful that the sun shines and the skies are a glorious blue. It’s chilly outside, students are bundled up in jackets, gloves, and hats. I’ve noticed fresh buds are forming on the bushes on the Corvallis campus along Jefferson Way. Oh Spring… Then it hits me. It’s barely mid-January! Where has Winter gone? Did it arrive? Did I miss it?! 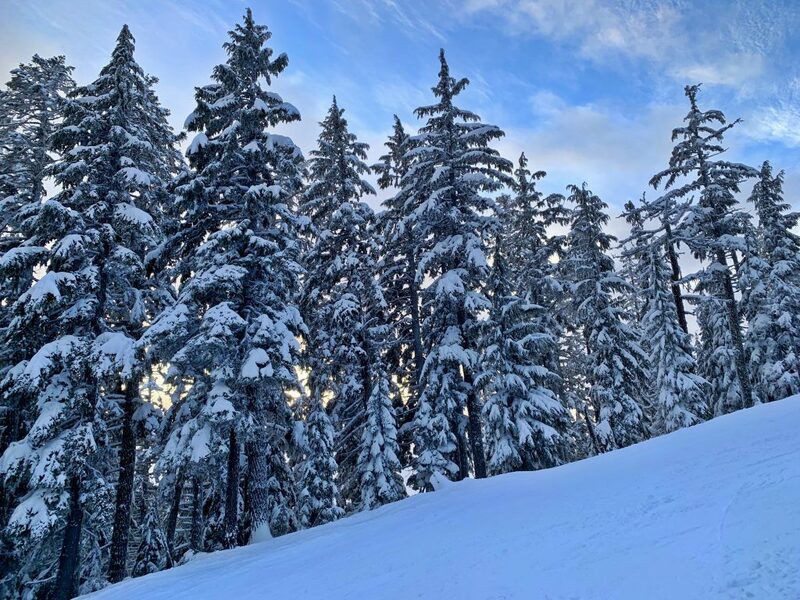 The Herald and News published a brief article about Oregon’s snowpack showing that is below normal again and data shows that the state is reaching historically normal levels less often. “It’s pretty clear that the idea of what’s normal is shifting, and that we’ve just become accustomed to these bad or below average years,” said Kathie Dello, a climate scientist with Oregon State University. If you’d like to know more or read the article itself, click HERE. Need a few helpful hints to get you back in the saddle at OSU? Here are some ways you can prepare for Winter term and beyond! Check in with the Fernhopper Upcoming Events page and the Student Resources & Engagement Events & Activities page and then save the dates on your calendar! Make appointments to meet with your academic advisor if needed. Do you need a job or internship? Student Resources & Engagement updates the CoF Online Employment page regularly! Schedule a job shadow to explore careers. Follow Student Resources & Engagement on Twitter for updates and reminders! Make sure you read the monthly Student Resources & Engagement email with all of the upcoming events and activities that will help you engage and connect with College of Forestry opportunities! Don’t forget Student Resources & Engagement is located in 133 Snell Hall. Stop by if you have questions! Ever Wanted to Study Abroad? Here’s Your Chance! 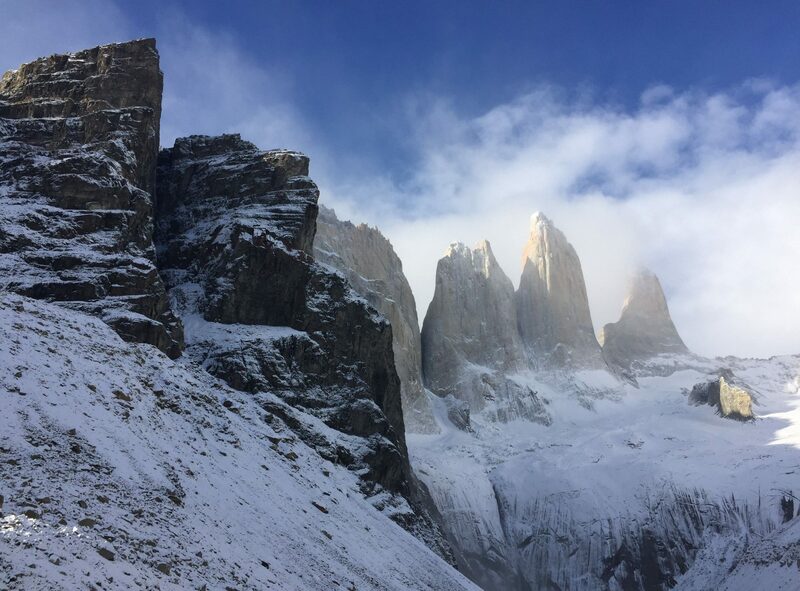 Applications are now open for 3 CoF faculty-led programs in incredible destinations: Chile, Borneo, and Alpine Europe! DISTANCE STUDENTS, there is an online info session discussing international opportunities on Monday, Nov 19, 5pm PST. Get details about connecting and RSVP to CoF.International@oregonstate.edu. Journey to Chile this Spring Break to discover a landscape that will feel at once familiar and starkly new. Connect with faculty and peers from two Chilean universities and build field skills as you trek through Chilean forests to learn about biodiversity, forest and wildlife ecology, sustainable forest management, and ecosystem services. Offered with opportunities for Spring term internships. Dive into the complex ecological, social, economic, and political dimensions of tropical forest conservation in Malaysian Borneo. Meet with regional conservation leaders and scientists, assist in field research, and experience firsthand the efforts that work to preserve some of the world’s most remarkable forests and wildlife. Offered with opportunities for Summer term internships. Visit Slovenia and northern Italy to explore the value chain of wooden products from forest through manufacturing, design, and construction. Experience cross-cultural exchange with university students from Slovenia and learn from their faculty and industry leaders. This program will include industry tours of innovative companies that focus on the manufacture and design of sustainable products made of natural materials. Find more details about these and other opportunities abroad, such as exchanges and internships at http://www.forestry.oregonstate.edu/international. Or use the link to the Facebook event. Have you heard about the very exciting opportunity to engage in partnerships with faculty outside of the classroom while getting paid?! The goal of URSA Engage is to provide first and second year students, and transfer students in their first year at OSU, opportunities to pursue research or a creative activity under the guidance of an OSU mentor. Students who are selected will receive an award of $750 and their faculty mentors will receive $250 to support the project. The program is available to undergraduates across all academic disciplines. Projects will take place from the middle of winter term 2019 through the end of spring term 2019 (15 weeks at 5 hrs/week). Everything you need to know is live on the website. Go to the URSA Engage website and read through the faculty mentor project descriptions. RSVP and attend one of the facilitated informational/networking workshops (not required but highly recommended). Each faculty mentor project description will tell you which workshop that faculty mentor will be attending. Reach out to faculty via email and set up a meeting to discuss applying to the program. Once you find a mentor, have your faculty mentor read your final application and sign the Faculty Mentor Approval Form, which will need to be attached. Ready to unpack racial and ethnic identity, pursue commonality, and find new ways to replenish individual wholeness? Do you know how to recognize racism and respond to it in a healthy way? Let’s examine the historical experience of race, ethnicity, and nationality in the U.S. and learn effective ways to disrupt discrimination in daily life. These weekend long retreats promote campus dialogues about race and racism. Each of the retreats engage in the active exploration of the concept of race and how race influences our lived experiences and interactions. As we begin preparing for our Winter Term retreats we ask for you to look within yourself and identify if you could benefit from these opportunities. To apply for a retreat please click Here! We offer a supportive learning environment for participants to unpack racial and ethnic identity through storytelling and to build a community of peers and mentors who support their growth. We hope that by the end of the retreat participants will have found commonality in their various experiences and identify tools to navigate, heal, and make meaning as racialized beings in a U.S. context. The Examining White Identity (EWI) retreat focuses on White identity development in both personal and institutional contexts, while introducing strategies to help students understand their relationships to others, and provide students the skills to help build community among diverse communities. This retreat helps students understand how notions of race and difference have been constructed historically, how they affect us today, and how best to interrupt discriminatory behaviors and to develop a global mindset that is rooted in social responsibility for our shared community. The International Student Social Justice Retreat was launched at OSU in February 2016 in the spirit of initiating dialogue on issues of diversity, ethnicity, race, and nationality in the U.S. This retreat helps participants understand the socio-historical American narrative on race and ethnicity, and provides participants with skills to manage and disrupt discrimination based on their perceived identities. By the conclusion of the retreat, you will have a better understanding of privilege, power and positionality, in-group and internalized oppression, identity development models, and be more self-aware of your multiple identities. You’ll learn by active participation just how to recognize racism, respond to racism in a self-affirming and positive manner that is appropriate for the situation, and replenish by taking care of your needs in order to maintain a healthy physical, emotional, and spiritual self. We would like to receive all applications by Monday November 12, 2019. Fall is Hiring Season for Many Government Agencies. Are you Ready? Right now is the prime time to be applying for jobs in many different government agencies! What is holding you back? If you are already in the application process, do you feel as if you are adequately prepared? Thinking about applying down the road? Why not get ahead of the game. Networking is very important in getting your foot in the door. So if you can volunteer, get an internship, or take on a part-time job with a local agency, that’s a great first step! Once you’ve demonstrated your ability to succeed in a government position, you are much more marketable. 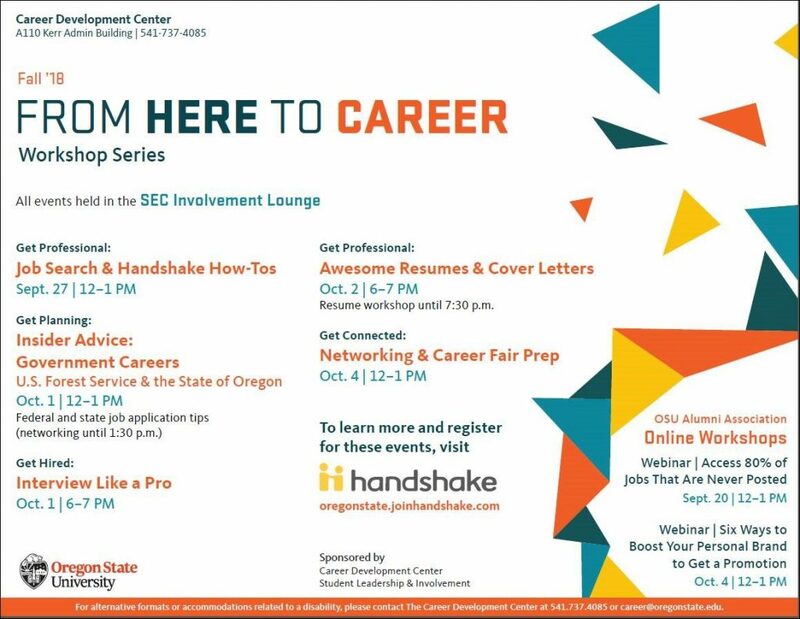 Come to one of the career fairs or events at the college with OSU staff and government employers and introduce yourself. Bring your resume and get to know the person and/or agency, then follow up after the fair. Register in Handshake for any of the following workshops. They are all coming up very soon! Are you interested in finding out what you can do with a degree in forestry? The career possibilities are numerous and there are a number of resources available to help you explore potential careers and benefits of a forestry career. One such resource is an online guidebook that will help you explore forestry careers and internships. It’s available at FireScienceOnline, which began in 2012 to provide quality data and information for students pursuing a career in fire science. It offers tools and resources that help students and professionals make well-informed decisions about their education and training. This site offers information about a variety of careers, training and education requirements, and average salaries. If you are interested in Fire Science, then take some time to explore FireScienceOnline. Student Resources & Engagement also provides resources to explore some of the careers available in the fields of forestry, recreation and natural resources. Explore the Employment Opportunitiesweb pages for information about the SAF Job Fair, Job Shadow Program, career information. Check out the Find a Job or Internship page for current job and internship listings, job search tips and resources and a directory of College of Forestry employers contacts. Be sure to take advantage of the numerous resources available to explore careers and find temporary and permanent positions. It’s still summer but the harsh reality is that we are only 43 days away from the start of fall term. Here are some ways you can start preparing for the upcoming term! Keep any eye out for an announcement about the 2018-19 Mentored Employment Program! Enjoy the rest of your summer and we will see you in 43 days!